In 1802, the Emperor of Hue, Gia-Long [Nguyễn Ánh], the first Emperor of the Nguyễn Dynasty of Vietnam, took advice from a French doctor, J M Despiaux, about organising medical assistance to the indigenous people. He established provincial physicians throughout the Empire for the sick, the elderly, the incurable, the infirm, and the indigent. This included people with leprosy who were eventually organised into special villages where they could live a life in common with their mandarins, monks, and pagodas, but where they were obliged to remain isolated from the other villages. Gia-Long’s predecessors were not as compassionate. The people were neglected, and they took to the roads begging and even robbing passers-by. Eventually the Catholic Missionaries took over the leprosy villages. In 1860, the French Administration began to subsidise this work and when the medical service was organised in the provinces, they based the new leprosaria on the same sites as the old missionary leprosaria. In 1912, when Tonkin was created (in the north of what is now Vietnam) a special leprosy service was established, with five regional leprosaria. Dr Georges Barbezieux was tasked with overseeing the Service des Léproseries, a program for the creation of five leprosaria in the Tonkin region of modern-day Vietnam: Van Mon, Te Truong, Qua Cam, Huong Phong, and Lieu Xa. Together, these leprosaria would eventually house around 5000 people. Barbezieux was committed to creating an environment of relative freedom and normality for the inmates. In each colony, he established marketplaces, political councils, and places of worship. Each inmate was given a monthly allowance, and interaction between men and women was allowed. In 1913, Barbezieux called for further funding to provide medical services to each leprosarium. His request was granted, and the funds were doubled, but the demands of the program continued to exceed the allotted budget. 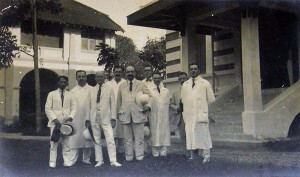 Other medical professionals expressed concerns that these leprosaria did not achieve complete isolation of the patients, and with the additional budgetary demands of the outbreak of war, the program was abandoned by 1915. In 1930, 0.58 / 1000 people were estimated to have leprosy. The disease was most prevalent in three main areas: in Tonkin, in the Red River delta; in the Mekong delta, in Annam, in the littoral band of the estuaries of the two large rivers. Sir Leonard Rogers suggested that the hot, humid climate of Indochina had an influence on the development of leprosy, but others thought that the presence of the disease had more to do with miserable and impoverished conditions within which people lived. People rarely looked for medical attention for leprosy, and they tended to conceal themselves if they could. They were usually discovered when they sought assistance for some other medical condition. Sometimes they were reported by their neighbours or the village authorities. They could be detained by the police who discovered them wandering on the roads. Suspected cases were verified bacteriologically by the Pasteur Institute of Indochina. Once their diagnosis was confirmed, they were arrested and interned in the leprosaria. After an unspecified time, they were free to return to their village, provided laboratory examination certified that they were not contagious. Monnais, Laurence. “‘Could confinement be humanised’? A modern history of leprosy in Vietnam.” In Lewis, Milton J, and Kerrie L MacPherson, eds. Public Health in Asia and the Pacific: Historical and Comparative Perspectives. Routledge (2007): 122-38.